Unimpressed Trump Sends Pentagon Back to the Drawing Board on Afghanistan | What Did You Say? WASHINGTON, D.C. — U.S. President Donald Trump, unimpressed by the Afghanistan war options presented to him during a White House meeting with his full national security team Wednesday, suggested they may have to go back to the drawing board to craft a strategy that does not mirror the failed ones employed by his predecessors, said an administration official. The meeting came as the Pentagon briefed lawmakers about plans to increase the U.S. military footprint in the country. 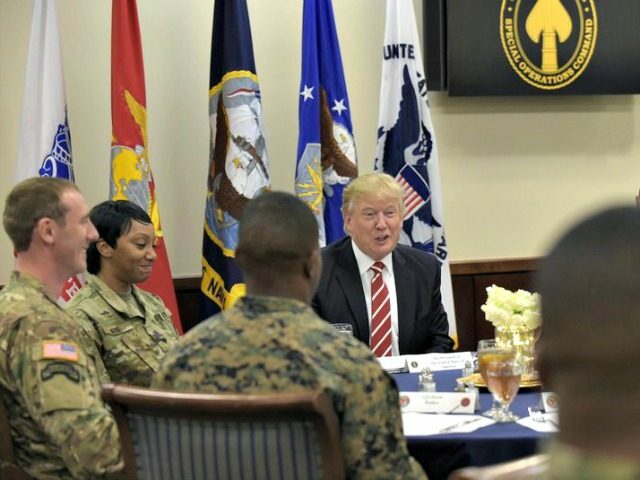 Contrary to mainstream media claims that the president has taken a completely hands-off approach to the 16-year-old conflict in Afghanistan, Trump presided over Wednesday’s meeting primarily aimed at discussing the U.S. war effort in Afghanistan, a Trump administration official familiar with the deliberations told Breitbart News on condition of anonymity. President Trump indicated that he is not satisfied with the strategy as it currently stands. The Pentagon and White House National Security Council (NSC) declined to provide specifics about the developing plan. President Trump demanded that his team go back to square one if necessary and create a realistic plan that ensures Afghanistan is ultimately able to stand on its own as a country, said the administration official, noting that the meeting served as a sort of wake up call for those involved in developing the strategy. It appears that besides the Pentagon, the NSC has at least some authority in setting the strategy. Asked about the meeting, the Pentagon did not confirm nor deny that the President asked officials to go back to the drawing board. “We’re not going to discuss White House meetings or direction,” said Adam Stump, a U.S. Department of Defense (DoD) spokesman, when Breitbart News asked whether or not it has been forced to start developing the Afghanistan war strategy from scratch and when it expects to present the plan to Trump. The NSC did not immediately respond to requests for comment. Trump has granted the Pentagon the authority to decide how many additional troops to deploy to the war-ravaged country. Currently, Mattis may increase that number of troops by between 3,000 and 5,000, from the 8,400 already there. Mattis noted on Friday that the number of additional troops has not been “finalized yet,” adding that the Pentagon is waiting from input from the U.S. State Department. Encompasses a way ahead in Afghanistan, including the possibility of sending more troops, but also a look at new ideas for dealing with Pakistan, which the US believes is supporting or turning a blind eye to a number of terror groups operating inside the country. The president made it clear he is not interested in any approach that resembles the strategies used by his predecessors and will not accept anything less than a dramatic overhaul, the official told Breitbart News. Directly dealing with Pakistan’s support for terrorists fighting the U.S. and its allies in Afghanistan would mark a significant departure from what America has done in the past. Most of the 2,255 U.S. military fatalities and 20,245 injury incidents have taken place in provinces that border Pakistan. The Pentagon spokesman defined what victory in Afghanistan means for the Trump administration, saying it ultimately involves a settlement with the Taliban and terrorists laying down their arms. The U.S. strategy in Afghanistan remains centered on working with NATO allies, operational partners, and the international community to defeat the remnants of core al Qaeda and to defeat other violent extremist organizations and terrorist groups, such as ISIS-K [Islamic State], to ensure that Afghanistan does not again become a safe-haven for groups to plan and execute attacks against the United States, U.S. persons overseas, or allies and partners; and continuing efforts to provide financial and advisory support to the Afghan Government and to enable a well-trained, equipped, and sustainable ANDSF [Afghan National Defense and Security Force] that provides security in Afghanistan. The U.S. and Afghan Governments agree that the best way to ensure lasting peace and security in Afghanistan is through reconciliation and a political settlement with the Taliban. The United States supports an Afghan-led, Afghan-owned reconciliation process and supports any process that includes violent extremist groups laying down their arms. In recently issued reports, the U.S. State Department and the Pentagon have accused Pakistan of willingly serving as a safe-haven for the Taliban and its affiliates, including the deadly Haqqani Network. The Taliban affirmed its relationship with al-Qaeda in December 2016.